The Jack Daniel’s Cigarette Case is a great gift for the bourbon and cigarette lover and is the perfect complement to a bit of Tennessee whiskey on the rocks. 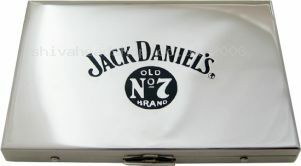 The shiny metal finish and Jack Daniel’s branding makes this cigarette case stand out from the crowd and can fit 14 cigarettes held firmly in place by strong elastic. Whether you enjoy a tipple while relaxing at home or in a pub, you won’t be far away from your favourite smoke with the Jack Daniels Cigarette Case. The Jack Daniels Cigarette Case is available now for £16.99; why not check out the Jack Daniel’s range of cigarette case and hip flasks available at the Shiva Head Shop website. Everyone likes a bit of a tipple now and again and one of the best ways to have a drink when you out in the great outdoors is to have a hip flask. Jack Daniel’s is synonymous with making the best Tennessee whiskey and the Jack Daniels 2.5oz Embossed Hip Flask is a great way to enjoy your favourite tipple. 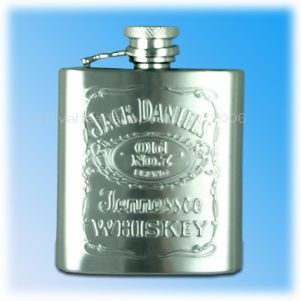 This traditional style hip flask is made from highly polished stainless steel and has the Jack Daniel’s logo embossed on the front; it can hold up to 2.5oz of whiskey (or whatever takes your fancy), so you’re never far away from a quick ‘pick me up’. The Jack Daniels 2.5oz Embossed Hip Flask is a great present for any whiskey enthusiast and will give many year of service to its lucky owner. Please note: This hip flask is designed to contain alcoholic drinks and should not be used to hold any beverages with acidic content such as cordials or fruit juices.